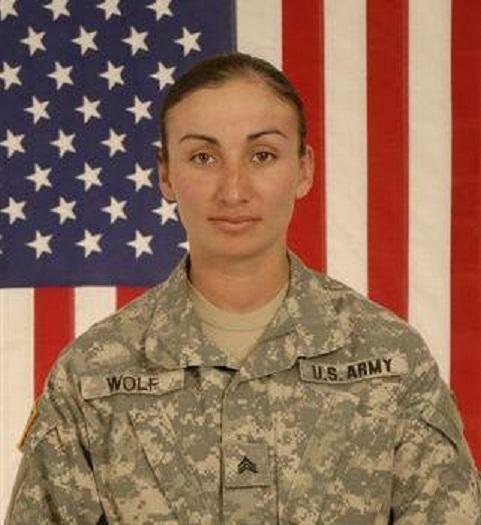 Duvi Killed in Afghanistan of wounds suffered when insurgents attacked her vehicle with a rocket-propelled grenade. Sgt Eduviges 'Duvi Precidado' Wolf of Hawthorne California emigrated from Mexico along with her four sisters and their parents to California. At Leuzinger High School, Duvi was an A-B student and member of the Junior ROTC. As a teenager, she signed up for the Hawthorne Police Departments Explorer Program where she worked for the department fingerprinting children, working traffic control at parades, and learning what it took to become a police officer. At the El Camino College Academy, she graduated as a top ranking cadet. She joined the army shortly after graduation, wanting to do her part to protect the country and to help others. While stationed at Fort Bragg, Colorado, she met her husband Josh who was also serving in the army. The couple have two daughters, Valerie and Isabel. Her Awards and Decorations include the Army Commendation Medal, the Army Achievement Medal, the Army Good Conduct Medal, the National Defense Medal, Afghanistan Campaign Medal with Star, Global War on Terrorism Service Medal, and Army Service Ribbon. Duvi died at age 24 in the Kunar Province, Afghanistan of wounds suffered when insurgents attacked her vehicle with a rocket-propelled grenade. Buried at St Peter's Catholic Cemetery in Farmer South Dakota.